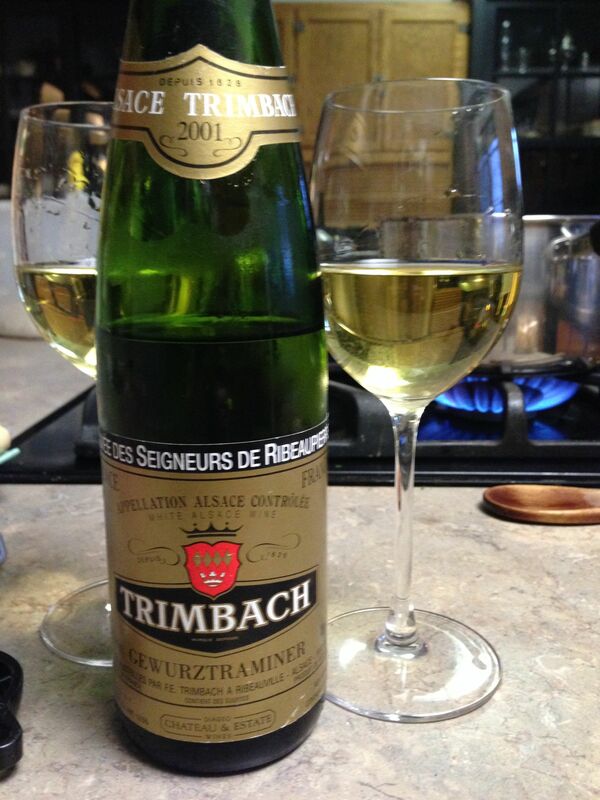 In our cellar we found an aging bottle of 2001 Trimbach Gewürztraminer Cuvée des Seigneurs de Ribeaupierre. After some of our previous experiences with older wines, I was a bit trepidatious. Would it still have some “spice”? Or leave us flat? Arid porcine minerality? I fell to wondering how a wine could possibly be porcine. Or indeed, arid and porcine at the same time. In any case, we opened it up and poured. It had a half-floral, half-fruit scent, rich and sweet, that reminded me of certain Rieslings we’ve enjoyed. I can see why the bouquet is often described as lychee fruit, rich, sticky and tropical. In the mouth it was not as sweet as I expected. The flavor was less florid than the scent, but still pleasing and balanced. The finish, alas, dropped off abruptly. Checking the prices on this wine, I noted with glee that it’s being sold in some wine shops for as much as $90! The website of Alsatian producer Trimbach is worth a visit for the lovely images of the vineyards and cellars of Ribeaupierre. Not to mention this charming family photo of the Trimbachs, who have been making wine there for thirteen generations: patriarch Hubert, his nephews John and Peter, and daughter Anne. Trepidatious is my word of the day 🙂 And it’s always a good sign, I find, if the WP spellchecker undersquiggles a word in red. I take it to mean that it doesn’t feature in the Redneckster’s (or whatever “dictionary” it uses) edition. It did. Although, I often don’t see my own typos, so it does come in handy at times. Hmmm, do you perhaps reside in the wonderful Commonwealth? I have several bottles of this exact wine in my cellar that I procured from the infamous PLCB. I, too, appreciate over-the-top-ridiculous tasting notes! I reside in the US, Ohio to be exact, where we have a ridiculous patchwork of wine distributors. It’s difficult to find anything reviewed in a different state, or even a different part of the state. But we manage pretty well 😉 There’s always a good bottle to be had. Yes, a swinish wine is quite puzzling! Re the “Porcine” note – maybe they were trying to indicate “smoky”, like bacon?! (Did you detect any of that?) Otherwise, yes those are very odd notes. That’s a thought! It’s the only connection I can imagine between pig and wine… but I wonder if perhaps the person was confusing “porcine” with “porcelain” to suggest a mineral quality? Your guess is as good as mine!